(ZIZ News) — The Ministry Of Agriculture hosted its Farmers and Fishers Prize Giving ceremony at the Department Of Agriculture Conference room on Tuesday. The annual ceremony was hosted to cap off the World Food Day week of activities which began on October 10. During his feature address, Minister of Agriculture Et Al, Hon Eugene Hamilton, encouraged the farmers present to keep pushing despite the many challenges. “It is a challenge to us as Farmer’s to ensure that what we produce, we are satisfying not just our pockets by going down the market, some of which will perish anyway but will satisfy the needs of the world”, The Minister said. The awards were presented in categories including Best Managed Small Ruminant Farm, Best Managed Large Ruminant Farm and Best Managed Rabbit Enterprise and many other categories. The 2016 “Best Crop Farmer Of The Year” award was presented to Mr. Aaron Hodge. The awards ceremony is hosted every year to recognize the Federation’s farmers and fishers for their outstanding work and contribution to the agricultural sector throughout the year. Remarks were also presented by Senior Environmental Officer, Ms June Hughes. Acting Director of Agriculture, Dr. Tracey Challenger chaired the prize giving ceremony. 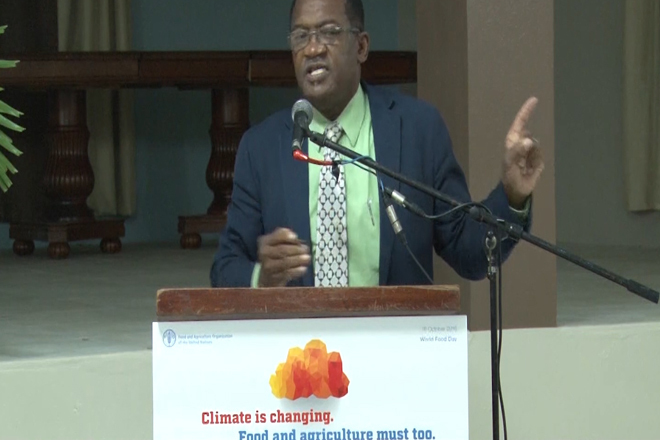 The world food day week of activities was held under the theme: “Climate Is Changing, Food And Agriculture Must Too”.